Our major summer project is the fixing up of our backyard. The deck stairs had rotted and needed replacement. 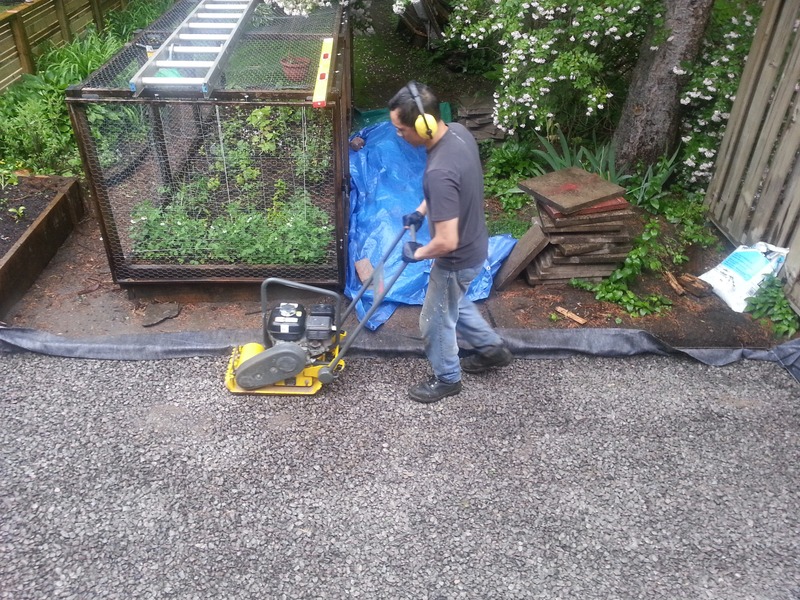 When W- ripped out the planks, he found that the stringers needed to be replaced too. It turned out that the deck wasn’t supported by enough posts. One of the posts it was supposed to be supported by was floating in mid-air, since the post had been placed on a patio stone that had since then sunk a little. So we poured a concrete post, and he redid the wooden post above it. Now we’re working on the patio stones so that the stringers for the stairs could sit on a stable surface, which means digging enough to lay 4” of gravel, 1” of limestone screenings, and patio stones. This was our first time doing a bulk order of material: 2.5 tons of gravel and 0.5 tons of limestone screenings from Islington Nurseries. The truck dropped both off at 10am on Monday, onto the two tarps we’d laid out on the boulevard. We had looked for pictures to get an idea of just how much three tons of material would be like, and fortunately there were a few pictures that included dogs / shovels / other scales. Three tons is a lot to think about (that’s almost an elephant! ), but it was less intimidating in person. W- and me spent the better part of the day moving, leveling, and compacting the gravel, with frequent breaks for home-made pizza and brownies. 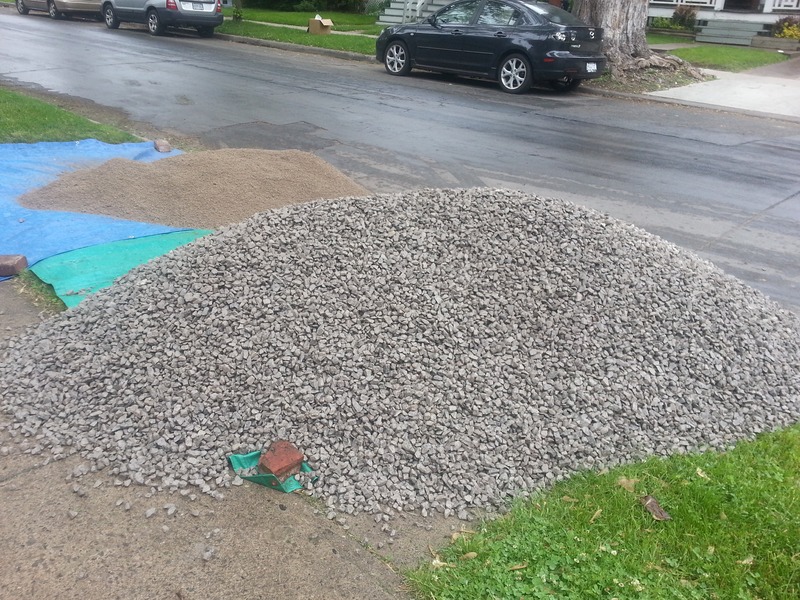 We shoveled the gravel into buckets and dollied it over to the backyard, where we poured it out onto the area we’d dug up. Three neighbours offered to lend us wheelbarrows, but the bucket + dolley system worked out well for us because it kept the weight manageable. It was our first time renting a power tool from Home Depot. This is W- with the vibratory tamper, and I took it for a few spins as well. This is definitely down the path of an Alternate Universe Sacha – when I was growing up, I never thought I’d be learning these things. I assumed I’d be living in an apartment someplace in the Philippines, probably close to a university… I’ve definitely travelled down a different pants-leg from what I imagined in high school. It’s good, though!